In my “The Diary of a Keen Upgrader” post I already mentioned the steps required to upgrade vCenter Operations Manager. I have another environment where vCOPs upgrade was required and I thought I should document it. Upgrade the OS to SUSE Linux Enterprise Server 11 to SPx. Click Browse…, select the VMware-vcops-X.X.X-build.pak file, Select Open. Log in to the Administration portal and verify that the Update tab indicates successful upgrade. You might need to refresh the browser to view the updated product version and build number on the Status tab. Log in to the vCenter Server that manages the license for vCenter Operations Manager, and apply the new vCenter Operations Manager 5.8.x license key. You must re-apply the new license key in the vCenter Server after the upgrade. If you do not, you will see reduced functionality in the vCenter Operations Manager interface. Log in to the vSphere Client or the custom UI to verify that the vCenter Operations Manager interface is displayed properly. This procedure is applicable when performing an in-place vApp OS upgrade to SUSE Linux Enterprise Server (SLES) 11 SP3. 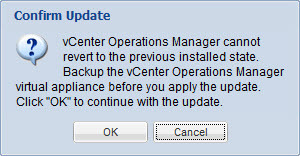 An OS upgrade is required to run vCenter Operations Manager 5.8.4. 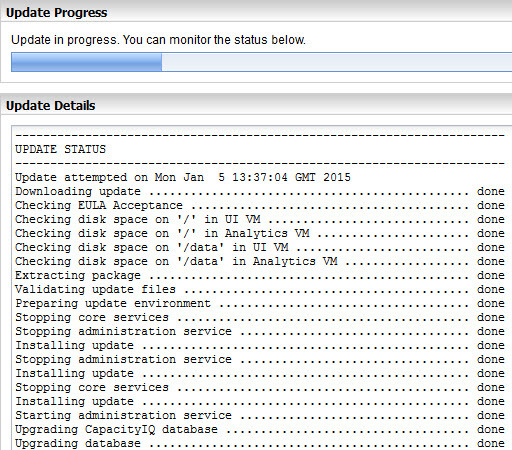 Copy the PAK file (VMware-vcops-SP3-2191616.pak) to the data drive of the UI VM. You can use SCP or WinSCP to copy the file. The file is 3.35 GB so make sure you have the disk resources to copy this into the vApp. The vApp should have been provisioned with plenty of space, but confirm the sufficient disk space on the underlying physical disk if the vApp was thin-provisioned. Log on as root (not admin!) to the UI VM console. This will upgrade both the UI and Analytics VM. Upgrade will start on the Analytics VM and then the UI VM. The entire process can be quite lengthy. The upgrade process is complete when the command prompt returns on the UI VM console. Log back into the vCOps User Interface to verify the service is back up and running. Perfect work ! Thank U !